Secondary Inscription: Illegible remains of a monogram above the water trough at right. In a barn, a young maid squats while milking a brown and white spotted cow. Standing nearby, another cow seems to be waiting its turn. 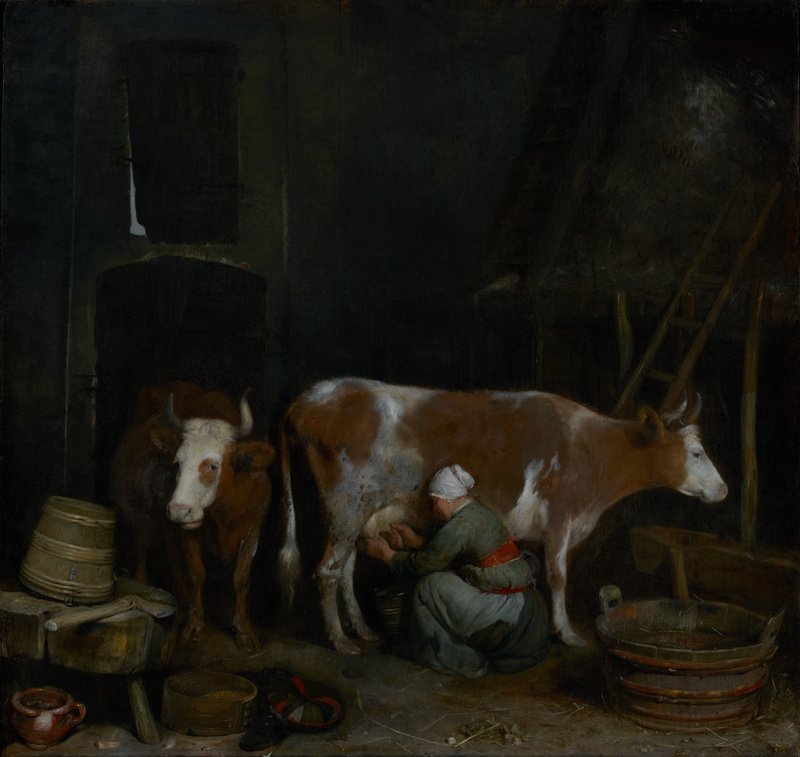 Gerard ter Borch treated the routine chore of milking in a straightforward manner, rejecting the humorous themes often favored by seventeenth-century Dutch genre painters. He was especially skilled at rendering the textures and surfaces of objects like those found in the foreground: the roughly hewn stool, the wooden basin filled with water, the chipped ceramic crock, and the shiny metal hinges of the buckets. The painting's muted colors and subtle play of light are characteristic of Ter Borch's work. Dr. A. K. K. W. Erasmus (Aerdenhout, The Netherlands), sold to the Hamburger Kunsthalle, 1913. Hamburger Kunsthalle (Hamburg, Germany), sold upon the death of the director Alfred Lichtwark (1852 - 1914) to a private dealer, 1914. Gustav Krupp von Bohlen und Halbach, 1870 - 1950 (Villa Hügel, Essen, Germany) and Bertha Krupp von Bohlen und Halbach, 1886 - 1957 (Villa Hügel, Essen, Germany), upon his death, retained by Bertha Krupp von Bohlen und Halbach. Bertha Krupp von Bohlen und Halbach, 1886 - 1957 (Villa Hügel, Essen, Germany), probably by inheritance to her son, Alfried Krupp von Bohlen und Halbach, 1967. Probably Dr. Alfried Krupp von Bohlen und Halbach, 1907 - 1967 (Essen, Germany), probably by inheritance to his sisters, Waldtraut (Krupp) Thomas Burckhardt and Imgard (Krupp) Eilenstein, 1967. Edward Speelman, Ltd. (London, England), sold to the J. Paul Getty Museum, 1983. Hoet, The Hague. Catalogus van Schilderyen, van Mr. Samuel van Huls, Burgermeester van s' Gravenhage. September 3, 1737, p. 486, lot 87. Descamps, Jean-Baptiste. La vie des peintres flamands, allemands et hollandois [...]. 4 vols. (Paris: Charles-Antoine Jombert, 1753-64), vol. 2 (1754), p. 127. "Aanwinsten van het Mauritshuis." Bulletin van den Nederlandschen Oudheidkundigen Bond, 2nd ser., 1 (1908), p. 239, ill.
Martin, W. "De werkzaamheid van Dr. A. Bredius aan het Mauritshuis." Bulletin van der Nederlandschen Oudheidkundigen Bond, 2nd ser., 2 (1909), p. 116. Hofstede de Groot, Cornelis. Beschreibendes und kritisches Verzeichnis der Werke der hervorragendsten holländischen Maler des XVII. Jahrhunderts. 10 vols. (Esslingen a. N.: Paul Neff Verlag, 1907-28), vol. 5 (1912), p. 144, no. 463. Hofstede de Groot, Cornelis. A Catalogue Raisonné of the Works of the Most Eminent Dutch Painters of the Seventeenth Century, Based on the Works of John Smith. Edward G. Hawke, ed. and trans. (London: Macmillan and Co., 1908-27), vol. 5 (1913), pp. 140-41, no. 463. Pleitzsch, Eduard. Gerard Ter Borch (Vienna: Verlag Anton Schroll & Co., 1944), pp. 13-14, 42, 52, no. 32, fig. 32. Museum Folkwang Essen zeigt in Villa Hügel: Kunstwerke aus Kirchen-, Museums- und Privatbesitz, exh. cat. (Essen: Grafa-Krupp, 1953), p. 15, no. 14. Gudlaugsson, Sturla J. Gerard Ter Borch. 2 vols. (The Hague: Martinus Nijhoff, 1959-60), vol. 1 (1959), pp. 74-75, 96, 235, no. 74, ill.
Gudlaugsson, Sturla J. Gerard Ter Borch. 2 vols. (The Hague: Martinus Nijhoff, 1959-60), vol. 2 (1960), p. 94. Kamptz, Ingrid von. Aus der Gemäldesammlung der Familie Krupp, exh. cat. (Essen: Villa Hügel, 1965), p. 15, no. 7. Hoetink, H. R., and G. Langemeyer, eds. Gerard Ter Borch: Zwolle 1617-Deventer 1681, exh. cat. (The Hague: Mauritshuis, 1974), pp. 92-93, no. 18, ill.
Christie's, London. Important Old Master Pictures. December 11, 1981, pp. 204-5, lot 119, ill. "Acquisitions/1983." The J. Paul Getty Museum Journal 12 (1984), p. 311, no. 10, ill.
Fredericksen, Burton B. "Recent Acquisitions of Paintings: The J. Paul Getty Museum." Burlington Magazine 127, no. 985 (April 1985), p. 265. Sutton, Peter. "The Noblest of Livestock." The J. Paul Getty Museum Journal 15 (1987), pp. 97, 105-110, fig. 18. Heugten, Sjraar van. "Grazende modellen: Aspecten van het Nederlandse veestuk." In Meesterlijk Vee: Nederlandse veeschilders 1600-1900, exh. cat. (Zwolle: Uitgeverij Waanders, 1988), pp. 22, 270, fig. 14. Suidman, Ieneke. "'Wij hebben schoone Koeyen,' De Koe in de Kunst." Nouveau (1994), p. 62, ill.
Korthals Altes, Everhard. "The Eighteenth-Century Gentleman Dealer Willem Lormier and the International Dispersal of Seventeenth-Century Dutch Paintings." Simiolus 28, no. 4 (2000-2001), pp. 260, 282, 310, no. 55, fig. 8. Erkelens, Wies, et al. Vorstelijk vee: vier eeuwen nederlandse veerassen, exh. cat. (Apeldoorn: Paleis het Loo, 2002), p. 29, ill.
Oosterhout, Carlo van. Gerard ter Borch: The Guard Room. (Amsterdam: Kunsthandel Charles Roelofsz., 2002), p. 9. Wheelock, Arthur K., Jr., et al, eds. Gerard ter Borch, exh. cat. (Washington, D. C.: National Gallery of Art, 2004), pp. 108-10, 203, no. 25, ill.
Cornelis, Bart. Review of Gerard Ter Borch. Washington, D. C. Burlington Magazine 147, no. 1226 (May 2005), pp. 356-7. Wetering, Ernst van de. "Gerard Ter Borch en zijn atelier." Kunstschift 49, no. 3 (June-July 2005), pp. 23-27, fig. 48. Baer, Ronni, ed. Class Distinctions: Dutch Painting in the Age of Rembrandt and Vermeer, exh. cat. (Boston and New York: Museum of Fine Arts, with ARTBOOK/D.A.P., 2015), pp. 215, 224, 317, 322, no. 53, ill. Prepare elementary students for a trip to a museum. Practice formal analysis and review appropriate behavior and the roles of museums. Students visit a museum and use the elements of art to explore the differences between viewing original works of art and reproductions. This exercise reinforces what students learned on a museum visit about looking at an original work of art.